During recent decades, the range of assessments of the condition of the modern economic science has greatly increased – from very optimistic to extremely pessimistic ones. Increasingly frequent are opinions about decay and crisis of economics science calling its condition «a cancer disease» and referring it as «a victim of formalism» etc. Such rhetoric is casting despair on the intellectual community. And what is happening in reality? The author shows a reserved optimism in his assessment of the development of economic thought. His arguments are based on the results of the pioneer research conducted by economists who are Nobel Prize winners. And though the talented Swedish inventor Alfred Nobel did not initiate Nobel Prize in economics, the corresponding initiative by a group of Swedish scientists and bankers appeared to be a very successful experiment developing his ideas (this year is the year of its 40th anniversary). That is why the comprehension of that phenomenon is an impetus to important changes both in economic science as a whole and in economic theory as its fundamental part. Modern economic science, crisis of economic science, range of acquired knowledge, economic nobeleology. The present paper is concerned with confidence as a factor producing the essential effect on financial markets. Theoretical approaches are formulated to ensure confidence of market participants. Tendencies and regularities are substantiated of the confidence formation on Ukrainian and global financial markets. Confidence, non-confidence, paradox of credibility, world economic order, new financial civilization, world economic crisis, culture, cross-cultural aspect. In this paper authors explicated the essence of global financial imbalances, assessed their level and implications for global financial stability and disclosed the causes that led them to reach the hypertrophied level under current conditions. Researchers focused on investigating the nature of the first global economic crisis of 2007–2009, as well as the causes of the chain reaction in its spread to the sectoral and territorial dimensions of the world economy. It was proved that financial globalism creates structural conditions for accumulation of financial imbalances in the world economy, due to the fact that macroeconomic policy of nations is unable to resist against them, but only adapt to fluctuations in global financial conditions set by the world financial centers. Economic globalization, financial globalism, global capital, global financial imbalances, global financial market, foreign exchange reserves, external demand, external commitments, balance of payments, global financial interdependence, derivatives. 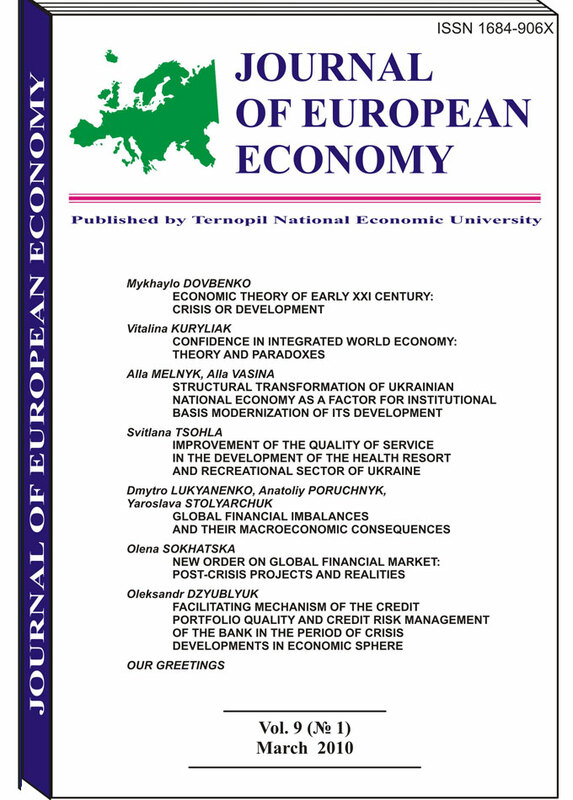 The present paper is concerned with the problems of a new financial order formation on global financial markets after the world economic crisis of 2007–2009, the reasons are systematized that hinder the proper reformation of the financial system in the context of reaching the higher degree of its functioning transparency and renewal of market participants confidence. New global financial market, derivatives, regulators, financial crisis, interstate regulation. The present paper is concerned with conditions and methods of successful confidence management. Interrelation is shown between confidence in a political system and that in a leader. The aspects are substantiated which are connected with the factor of confidence in financial and banking institutions activity. Confidence, non-confidence, antirecession management, confidence management, political elite, economic will, crisis of confidence, bank panic, confidence in national currency unit, bank recapitalization, state monitoring system, government of national confidence. Assessment is made of wholefood market development in the European countries. Proceeding from the dynamics of the development of ecologically clean food market in Poland and in some European countries (Liechtenstein, Switzerland, Austria and Germany), the author ascertains its dynamic increase. In this context, the determination of the perspectives for the development of wholefood market in Poland against the backdrop of a global financial crisis is the live issue. Market of wholefood stuffs, ecologically clean farms, certification of wholefood stuffs, distribution channels of wholefood stuffs. A detailed analysis of trends in labor market and employment in Ukraine and abroad was conducted. We identified a number of risks of domestic labor market, which allows allocating the labor market of Ukraine as a part of social security. We substantiated the possibility of adapting the European standards of development to the labor market of Ukraine. It was proved that the functioning of the Ukrainian labor market is an integral part of the labor markets of countriesmembers of EU, reflecting the approach to the standards of the European labor market in the context of the social security of the country in terms of Eurointegration. Labor market, Eurointegration, employment, unemployment, social guarantees of employment, income, wage, welfare, supply and demand of labor, government regulation of the labor market, social standards, social security. Modern tendencies of world economy development are researched. The complex methods of working-out of description models of modern indicators, identified by authors as index of world transnationalization, index of total globalization and index of financial globalization and also an algorithm of their calculation and graphical interpretation is created. 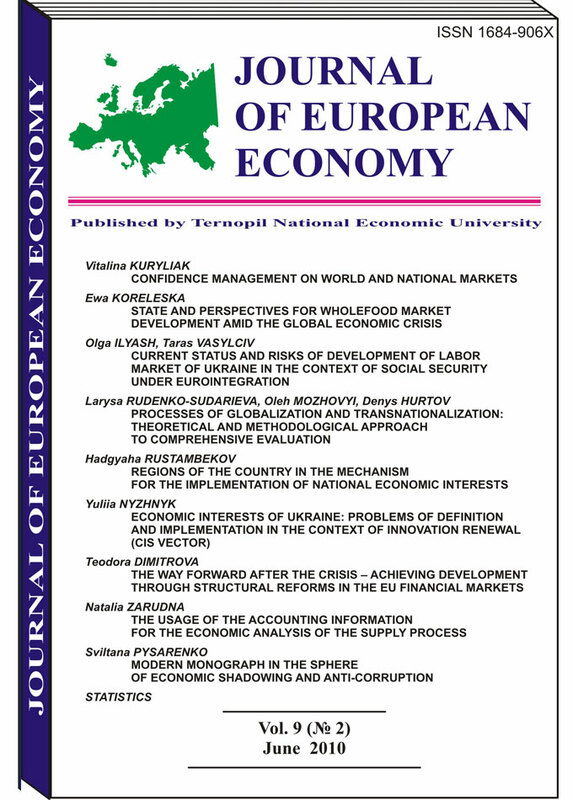 The authors’ methods of determination of developed indices of world transnationalization, total globalization, and financial globalization, which is on basis on comparative principles of theoretical generalization and improvement of key definitions and on generalization of conceptual approaches to prognosis of state of complex economic phenomenon are presented. 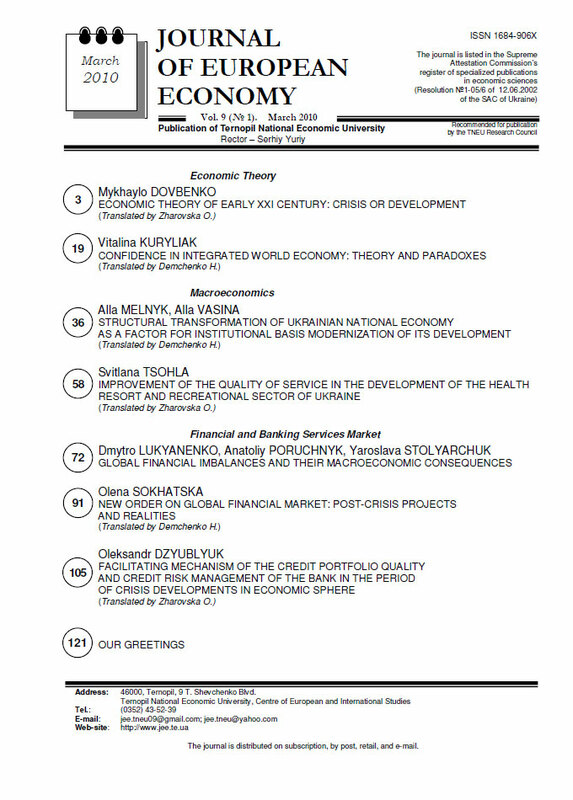 Directions of improvement of appropriate methods of supporting of national safety on the basis of usage of formed by authors’ indices which provides the possibility to evaluate state of economic safety comprehensively and to give scientific credence the most favorable and safe script of integration process for Ukraine are proposed. Globalization, transnational transformations, transnationalization, total globalization, financial globalization, direct foreign investments, corporate (individual) transnationalization, world transnationalization. The analysis of the regions as the most important elements of the national economic reproduction is conducted. The criteria of the regions’ formation are separated as well as perspectives of their cluster development in the process of market transformation. A special attention is paid to the experience of the regional economic development in Azerbaijan. Regions are evaluated as important means of the economic diversification, formation of integral economic system and implementation of the national economic interests. National economic interests, principle of factor (resource) advantages, territorial division of labour, international control, institutional form of organization, economic system. 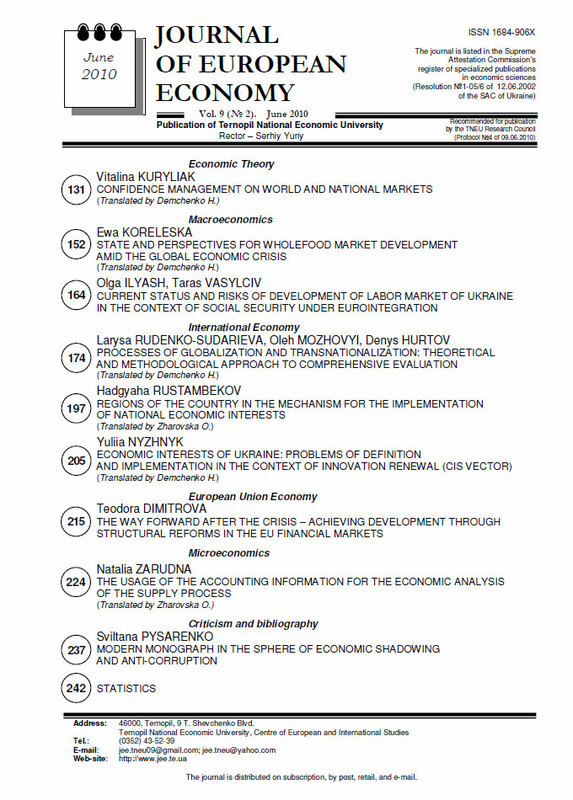 The paper is concerned with the problem of integrity and coherence of foreign economic policy of Ukraine from the view of priority of innovation model development. On the example of interrelations with the CIS countries ambiguity is demonstrated, and thus, the challenges faced for the implementation of Ukrainian economic interests in this given context. The key problematic issues are defined, which are faced on the way for effective trade and economic cooperation with the CIS, and a series of actions are offered to solve them. The algorithm is formulated for correct definition and implementation of economic interests of Ukraine in the global environment. The hard times EU economy is experiencing in the moment soon will inevitable come to its end. Looking ahead, under the assumption of a gradual modest recovery and the absence of the materialisation of major risks, financial market conditions are expected to improve further. In particular, liquidity and funding constraints for banks should continue to ease and risk premia in financial markets should decline further. Lending volumes should eventually turnaround and start to rise, though remaining at modest levels. This will stimulate the economy as a whole and will introduce conditions for stabilizing the financial market and encourage households and corporate to drive successfully the EU towards a well-functioning post-crisis environment. Control, regulatory reform, financial crisis, financial sector, structural reforms. The main stages of the economic analysis of the supply process on theenterprise with the usage of accounting information are described. The oriented order of the analysis of contract relations with the material resources’ suppliers concerning their feasibility, eurhythmy, timeliness of deliveries and correspondence to the raised requirements is conducted. The peculiarities of the analysis of enterprise’s supply organization in general and by separate shops, sections, individual working places etc. are considered. Economic analysis, maintenance supply, economic analysis methods, productive supplies, contract conditions, order portfolio, quality, assortment.